A humble priest, who loved his family, appreciated popular culture and surrendered to the will of God is the way Pia Luciani remembered her uncle Albino, better known to the world as Pope John Paul I, at an international gathering on his life and death. The two-day conference, “The True Pope John Paul I: A Man of Faith for Our Time,” was held Oct. 12-13 at Immaculate Conception Center, Douglaston, in anticipation of the centenary of Albino Luciani’s birth, Oct. 17. On that day, postulators for his sainthood cause were scheduled to formally submit the positio to the Congregation for Saints’ Causes. Conference speakers explored his life, spirituality and writings; dispelled myths about his death; and discussed the impact of his pontificate. Along with Pia Luciani, speakers included Loris Serafini, director of the Fondazione Papa Luciani in Canale D’Agordo, Italy; North Wales native Paul Spackman, author of God’s Candidate: The Life and Times of Pope John Paul I; and Mo Guernon, a Rhode Island-based writer who is penning a biography of the late pope. 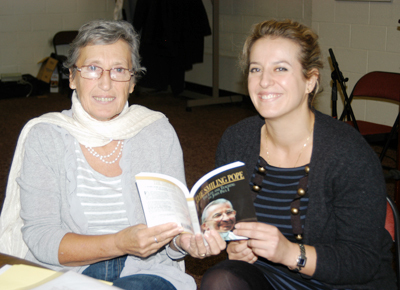 Dr. Lori Pieper, a Bronx native who is preparing to publish a collection of the late pope’s writings, organized the event to “make people more aware of him,” particularly as the Church marks the 50th anniversary of the Second Vatican Council, in which he participated, and the opening of the Year of Faith. After a delay in Italy, Pia Luciani arrived at the conference on Saturday to share personal remembrances of her uncle amid an intimate gathering of his enthusiasts and devotees. Her daughter, Morena Basso, who was baptized by the late pope, traveled from Barcelona for the event. In her talk, Luciani said her uncle had a “fraternal affection” for her. Her earliest memories of him were as a “smiling priest in a long black cassock” who would offer her sweets. When she went to boarding school, he escorted her on the train. He invited her to write to him while she was at school, and told her, “‘I promise I will always find time to answer you,’ and he kept his promise,” she said. He took an interest in her studies and activities, even through graduate school, and encouraged her to be a role model for her nine younger siblings. She said he had a great appreciation for culture. When he read a good book, saw an enjoyable film or heard an engaging piece of music, he was sure to recommend it to her. He also had a sense of humor, she said, recalling how she and her uncle passed an afternoon watching Charlie Chaplain films. That was how he embraced simplicity of style in his writing and all things. 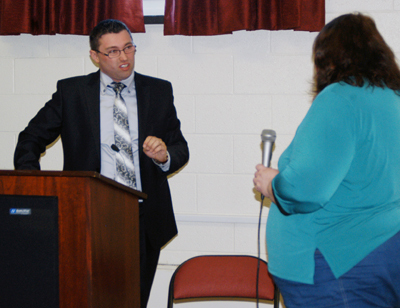 Loris Serafini, director of the Fondazione Papa Luciani in Canale D’Agordo, Italy, answers Dr. Lori Pieper’s question. She noted that St. Francis de Sales, patron of writers, was one of his favorite saints, and Luciani believes her uncle would’ve become a journalist if he hadn’t been called to the priesthood. During their exchanges, she said they also spoke about the Church and faith. Following the Second Vatican Council, he told her that there were three prevailing groups in the Church: those who, like him, accepted Vatican II as a way to improve the relationship between the Church and the world; those who were faithful to the Council of Trent and the First Vatican Council; and those who were eager to rush toward another, future council. The fact that her uncle became pope, she said, “was not a surprise. My father said many times that he is too different from others (priests) and we would lose him.” Lose him, she explained, in terms of him advancing in the Church hierarchy and being more removed from the family. When he was elected, Luciani said her uncle called her father to apologize for the attention it would bring to the family. “I didn’t look for it,” he told his brother. 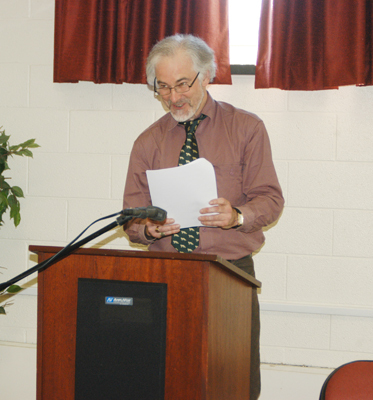 North Wales native Paul Spackman, author of God’s Candidate: The Life and Times of Pope John Paul I, spoke at the conference. When he prayed, she said, “he abandoned himself to God as a child to his mama,” and encouraged others to do the same. I was blessed to attend this fascinating gathering!….This article by Marie Elena Giossi is superbly written and truly reflects the “content” of the weekend conference! Is Pia still alive in 2018 and is it possible to get a letter to her?